KEE 125 - Keeway Q.J. The top of Keeway’s Cub-class 125cc offerings is the KEE 125, a sporty and thoroughly modern machine that looks just as comfortable in the pits of a racetrack as it does zipping though the city. 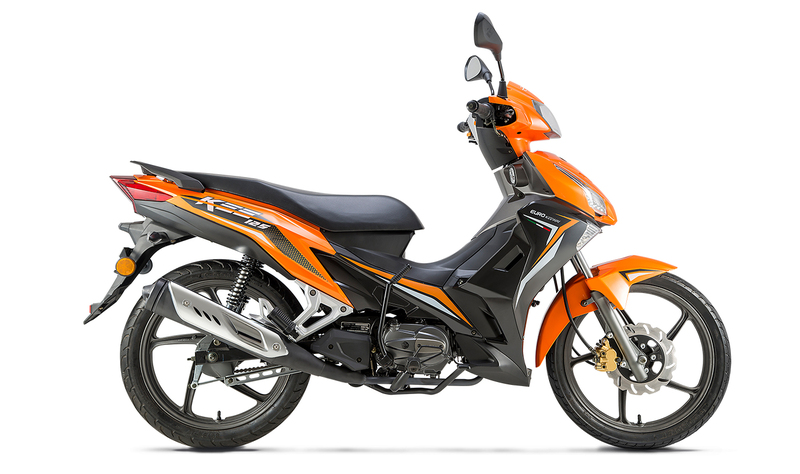 With sculpted bodywork and flashy graphics, the KEE 125 tells everyone that you’re into style and sport. But beneath all the curvy bodywork and luxurious paint is a thoroughly modern machine, one powered by a durable and surprisingly powerful 125cc four-stroke single-cylinder engine that’s really easy to use. The chassis is just as modern, with dual shocks in back and a telescopic fork up front, which is anchored by a disc brake for powerful and controllable stops. A dual saddle means you can take a friend along for the ride, and a high degree of comfort means you’ll both enjoy it. If you’re looking for a sporty Cub-style machine that’s also amazingly affordable, the KEE is the one for you! The KEE 125’s air-cooled, single-overhead-cam four-stroke engine is both reliable and powerful, and pumps out plenty of smooth, usable power – ideal for city trips or runs or paddock runs during track days. Twin shocks in back and a modern telescopic fork up front give the KEE 125 a highly plush ride, which keeps rider and passenger comfortable even on rougher city or country roads. With a comfortably sculpted two-place saddle, a very roomy riding position, wide set mirrors and low-vibration ride, the KEE 125 gives its riders and passengers a comfy perch, even on longer rides. With lightweight cast-alloy wheels, grippy tires, and a disc brake up front (with a drum unit in back), the KEE 125 handles and stops with plenty of confidence – perfect for veterans and beginners alike.